The friendly people at the Italian American Museum of Los Angeles passed on this discount for all Unemployed Eater readers: 10% your entire online order for their upcoming 4th Annual Taste of Italy event. 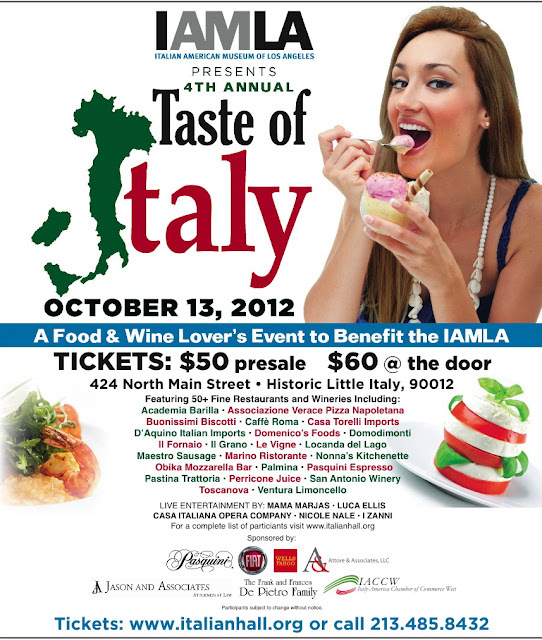 The event, which will feature some top notch Italian-American cuisine and wine from the likes of Osteria Drago, Locanda Del Lago, Il Grano and Nonna's Kitchenette (fresh from this season of "The Great Food Truck Race"), amongst many others, will take place on Saturday October 13th in Downtown LA. Also on the docket: appearances by Italy's top reggae band, an opera company, a virtuousa, and even Richard Grieco - which, let's be honest, may be worth the price of admission by himself. Proceeds benefit the restoration and exhibit upkeep of the Italian American Museum of Los Angeles, (the former) Little Italy's longest surviving building. For more information and to purchase tickets, visit their website. The code for the discount: ITAL10.